Superior comfort with the added security of a bolster. This bed sits on top of 3 inches of medical grade orthopedic foam, while the bolster is filled with premium polyfill made from recycled plastic bottles. The bed is made from soft, upholstery grade velvet and the sleeping surface is covered with super-soft microfleece. This bed is luxury from top to bottom. The cover is removable for easy machine wash and care. 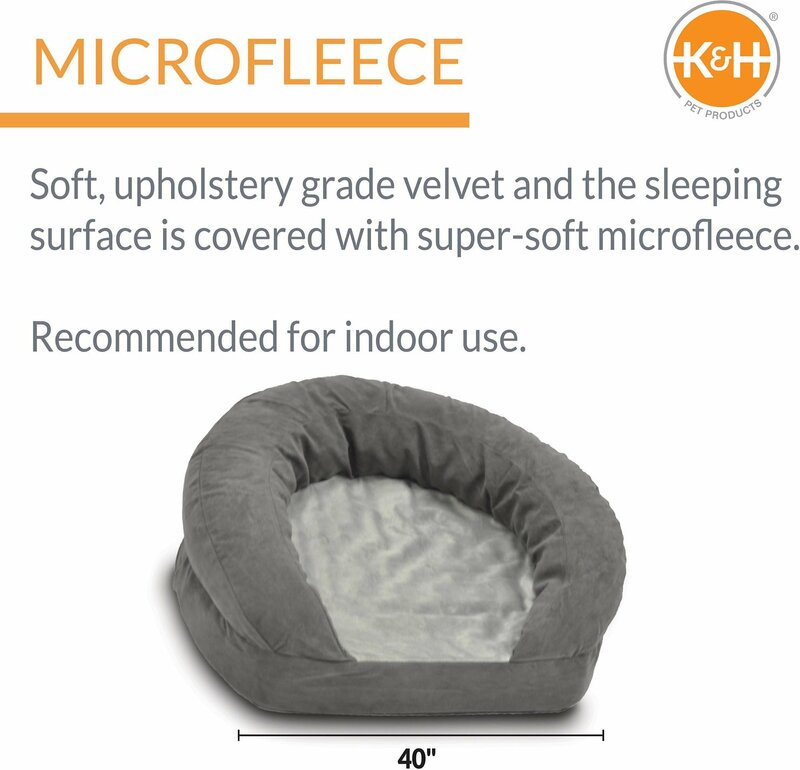 Made from soft, upholstery grade velvet and the sleeping surface is covered with super-soft microfleece. The base consists of 3-inch medical grade orthopedic foam. Bolster is filled with premium polyfil made from recycled plastic bottles making this bed eco-friendly. Easy-to-clean, just remove the cover and wash it on the gentle cycle with cold water and hang to dry or use the no-heat cycle on your dryer. Available in various sizes so you can pick the perfect fit for your furry friend. Unzip and remove the cover on the Ortho Bolster Sleeper™ for easy cleaning. To wash your dog bed cover, use the gentle cycle with cold water. Then, line dry and replace once fully dry. What is the sleeping area inside the bolster? What type of foam is used in this bed? 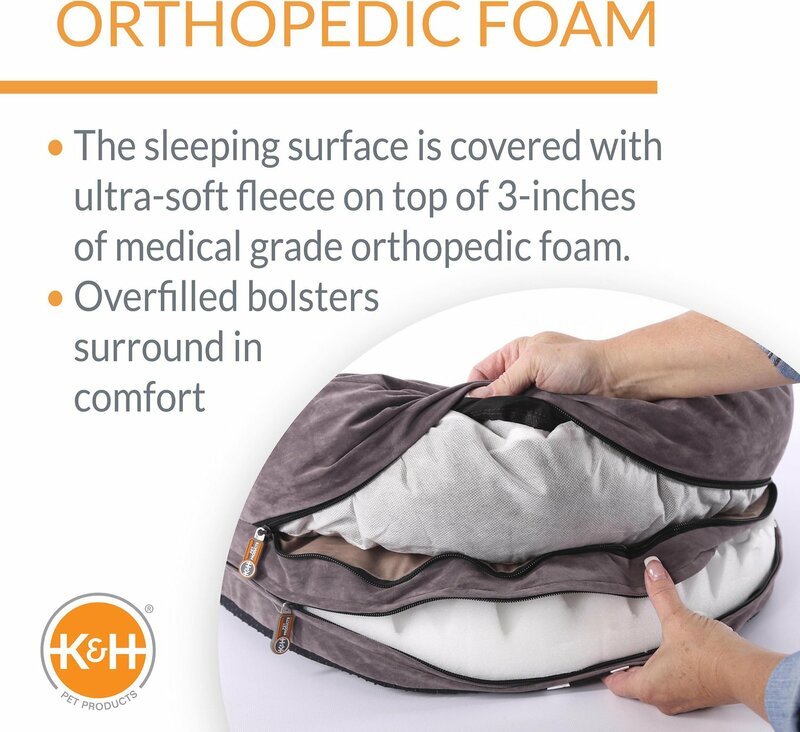 The Deluxe Ortho Bolster Sleeper has a base layer of support foam and a top layer of orthopedic foam. I noticed right away that my 14 year old dog favors this bed out of all beds (we have 5 other beds). The Ortho bed eases a lot of pressure because it soft and comfortable. He has very arthritis in his hind legs. Every loving pet owner wants to have our munchkins be comfortable. This bed does that. I would recommend K&H bed. I loved this bed when I first got it and so did my dog. The large size had plenty of room for my almost one year old sighthound. However, the fabric is THIN! My dog likes to move his bed with his teeth and easily punctured his bed. Very disappointed for the cost. I have bought cheaper beds that have been extremely durable and never got punctured. Dog likes it but not durable at all! My dog appears to love the bolster and bed but we had it barely 1.5-2 months and he already tore the fabric. He likes to dig on his bed but we never left him unattended with it (bed gets put away when we aren't home so all he gets is the couch, life is ruff). We always stopped him after a couple of scratches. We had a Kong tough bed before and it lasted about two years for a fraction of the price. 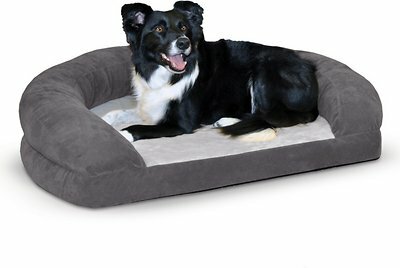 Do not buy this bed if your dog is not gentle with his/her bed. At first I was not sure if my dog would like this bed, he has been used to curling up in a slumber ball. At first my dog did not want to use the bed, once I added a blanket he quickly warmed up to the bed. Now I can find him curled up and snoring. The bed is just the right size, my dog is about 22lbs and about 19 inches long. It’s super comfy and has great padding. The non slip bottom prevents the bed from moving around too much. Very happy with the purchase. We recently adopted an 8 year old lab with hip dysplasia and were looking for a bed that would be comfortable and big enough for him to relax in. This certainly fit the bill! Dave loves it and hangs out in his bed when he's not chasing squirrels outside! This is a very nice bed. I have had it now for 3 years and it shows no wear even though my 2 Peek a Poos lay in it every day together. They really love it and it has not broken down at all they each weigh 15 lbs. and the foam is still very firm. They love it and mom loves it. Perfect fit I say. Have not had to wash it yet as they get groomed every 2 months and it has not soiled so can't speak on that, but I suspect that being the quality it is, it would wash up great. Highly recommend this bed. My dog is 10 years old and this is a great bed for him. The foam is nice and thick. I can tell he likes it a lot. The cats do too, I have to keep moving the cats off the bed so Zach can have it. My dog is getting on in age. He's never owned a bed before because he always jumped on the couch. He can't get up there alone anymore. When I'm awake, I can help him, but when I'm sleeping it was getting to be a pain because he woke me whenever he wanted to come up. He's really happy with his new bed and sleeps in it quite contentedly. He doesn't wake me after he goes out to his fenced run during the night. We're both sleeping better.